Best for Career Opportunities: Stetson’s LL.M. The International Jurist magazine lists Stetson University’s LL.M. program among the top nine law school programs in the country for career opportunities. Stetson LL.M. in International Law graduates gather with international programs staff at May 2015 commencement. The office of career development assists students in honing their resumes and cover letters in ways that attract international and U.S. employers. The International Jurist magazine article, “The Best LL.M. programs,” by Sherry Karabin, lists Stetson University’s LL.M. program among the top nine law school programs in the country for career opportunities. 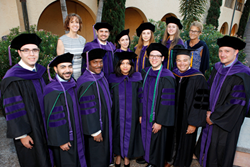 Stetson University’s law school in Gulfport, Florida, is also listed among the best places for foreign attorneys from South America, offering a location with fellow students and a large community from the region. Stetson is home to the LL.M. in International Law, as well as LL.M. programs in elder law and advocacy that offer classes online. Stetson’s May graduating class includes 12 LL.M. in Advocacy, four LL.M. in Elder Law and 10 LL.M. in International Law students. To learn more about the LL.M. programs offered at Stetson University, visit http://www.stetson.edu/llm.